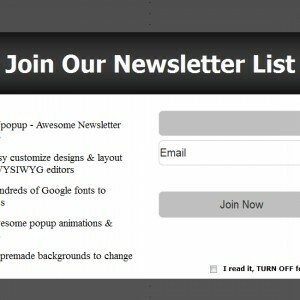 With ANpopup, you may easy add a floating newsletter popup into any PHP-based web page, any Wordpress theme (or all themes), any Joomla template (or all templates), any other PHP-based platforms: phpBB, Drupal, SMF, Opencart, Magento, Zencart, vBulletin, Xenforo, ... with just 1 include statement. Category: PHP. Tag: ANpopup Impressive Header Popup. You only need to upload them on your ANpopup’s theme folder, then use it. No installation required. Our themes are based on HTML markups only, you can create many awesome themes easily without knowing any PHP backend. All you need to do is create & test your themes to make sure they’ll work perfectly on major browsers, any screen sizes, of many devices. If you’re having hand-made ANpopup themes and would like to sell on here. 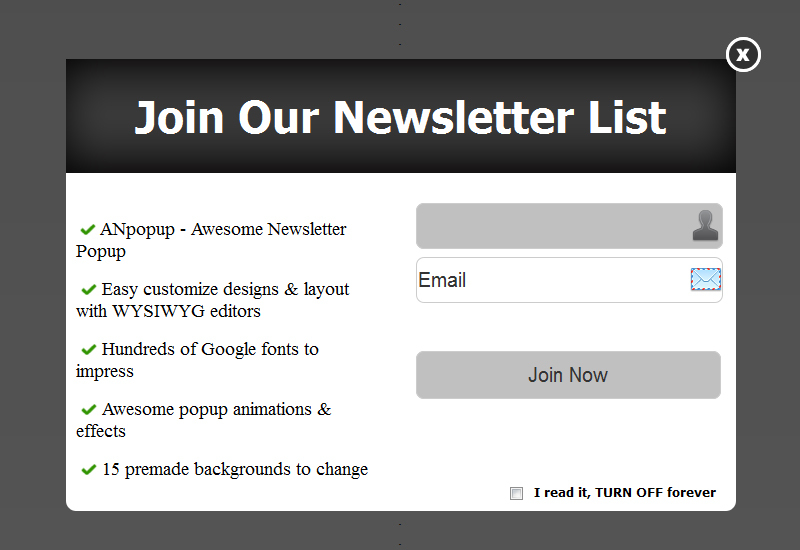 Be the first to review “ANpopup Theme: Impressive Header” Click here to cancel reply.